Friday has once again arrived. It's that last bit of effort to get to the weekend which can be so taxing to survive. Fortunately, Cramer Imaging has something which should help make the day a bit more bearable. Check out our featured "Photo of the Week" for some much needed but quick distraction material which your boss already approves of. 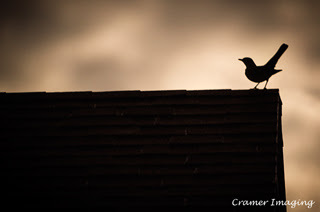 This week's feature is this monotone photograph of a small wild Bird standing on a roof-top while silhouetted against the sky. Wildlife photography, for some reason, has been difficult for me. I know, it's a difficult genre of photography for anyone. I find that it has been especially difficult for me for more than just the obvious reasons of dealing with live animals. I don't know why that is, it just is. With this photo, I happened to see a robin on top of the neighbor's roof. It was active but it was still staying there. I decided that I wanted to try for a photo of it. Strangely, the bird decided to stay there the entire time I went for my camera. That is highly unusual for me. I started with my standard lenses for taking photos. My standard wide angle Lens was no where near close enough for what I was going for. I switched up to my standard telephoto lens and zoomed way in to try re-framing in closer. It still wasn't close enough for what I wanted. It was time to break out some of the specialized lenses. My next attempt was to try a 500mm prime lens which I had acquired with my camera kit. Thanks to its setup, I have to manually focus it so I don't use it very often for this reason. Since I had some photos already with complete focus using the other lenses, I gave it a try. The 500mm lens had just the tight view that I wanted. I took several photos. The bird was just as cooperative as most animals are when I try taking photos of them: this is to say not at all. As the bird kept shifting around, I had trouble keeping it in focus but kept bravely trying. I managed to get this photo before it finally decided to fly off. Believe it or not, this photos is entirely in color. I made no alterations to the color scheme you see here. It was just that natural sepia tone when I captured it. This surprised me but ended up working out really well for what I was going for with the photo. This photo is available in sizes up to 16x24 inches. This beautiful photograph is one of my most popular photographs for memes. It really does lend itself well to adding text. It's also up for sale as a fine art piece. Just follow this link to our online store to buy fine art prints of this photo today.